100 Beacon is located on the NW corner of Beacon and Arlington, with 96 Beacon to the east, across David G. Mugar Way, 102 Beacon to the west, and 1 Arlington to the south, across Beacon. 100 Beacon was designed by architects Clifford Allbright and George Nelson Jacobs (who is shown as the “supervising architect” on the original building permit), and built in 1924-1925 as a ten-story, 40-unit apartment house. Architectural plans for the building — including elevations and floor plans — are included in the City of Boston Blueprint Collection in the Boston Public Library’s Arts Department (reference BIN N-4). 100 Beacon replaced a townhouse built ca. 1856 that later had been the Noble and Greenough School. 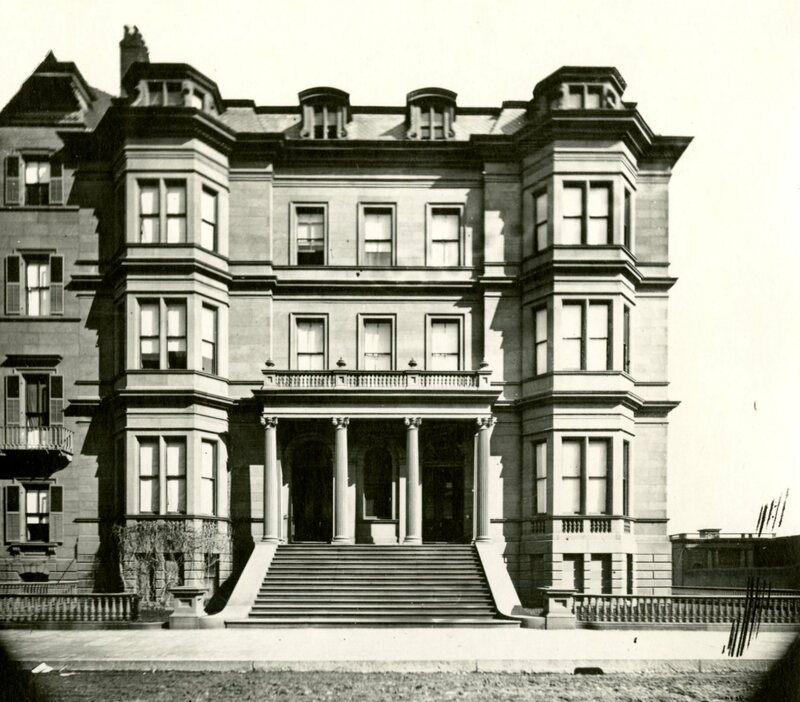 The original house at 100 Beacon was located on the western half of a lot with a 56 foot frontage on Beacon. The eastern half was a garden running the length of Otter Street (later Embankment Road and then David G. Mugar Way). In 1916, the Commonwealth of Massachusetts approved the widening of Otter Street, including taking a10 foot strip, reducing the lot at 100 Beacon to 46 feet in width and eliminating most of the garden land. When the house was replaced in 1924, the new building occupied the entire lot, including the former garden area. 100 Beacon was purchased on September 6, 1923, from William Spaulding and Dudley Pickman by Mary E. Macdonough and was demolished in mid-1924. 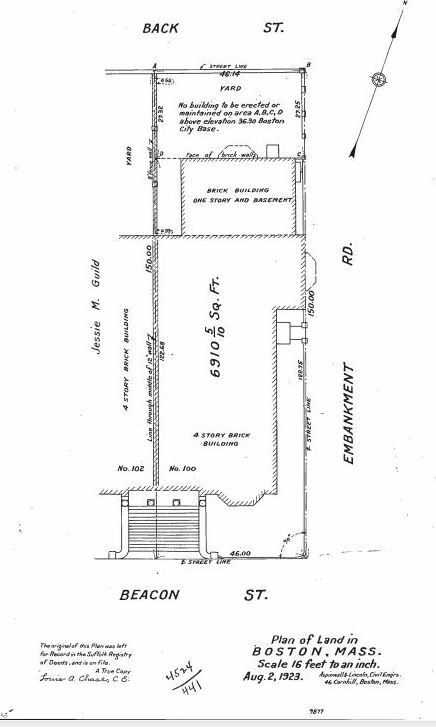 Mary Macdonough probably was acting for Samuel Altman, the real estate dealer who filed the original building permit application for the new building on July 3, 1924. Click here for an iundex to the deeds for 100 Beacon. 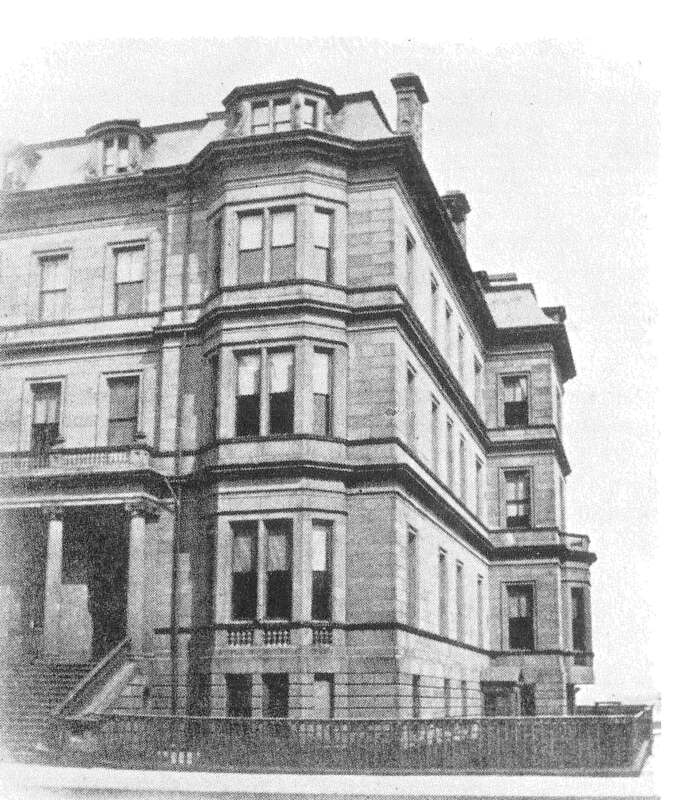 On May 29, 1925, the new building was acquired from Mary Macdonough by Edward Newton Wyner as trustee of the One Hundred Beacon Street Trust. He was a real estate developer who also was associated with Samuel Altman in the construction of a new apartment house at 6 Marlborough at about the same time. Edward Wyner also was embarking on building the Ritz-Carlton Hotel at 15 Arlington, which he would own and operate until his death in 1961. 100 Beacon was completed in 1925 and had been occupied by the 1925-1926 winter season. On June 20, 1927, 100 Beacon was acquired by real estate dealer Garrett J. O’Riorden and his sister, Agnes Celia (O’Riorden) Taff, the widow of William Walter Taff, as trustees of a newly organized One Hundred Beacon Street Trust. Garrett O’Riorden died in December of 1930, and Agnes Taff’s son, William Walter Taff, Jr., replaced him as a trustee of the One Hundred Beacon Street Trust. By the 1935-1936 winter season, Agnes Taff had moved to an apartment at 100 Beacon along with her children, Agnes Taff and William W. Taff, Jr. They previously had lived in Brookline. William Taff, Jr., was a realtor and president of the Brookline Motor Mart. His sister, Agnes, married in December of 1936 to Col. John A. Cutchins and moved to Richmond, Virginia. In July of 1937, William Taff, Jr., acquired 102 Beacon, holding it first in the name of his secretary, Katherine Kelly, while it was being remodeled, and then through 102 Beacon Street, Inc., of which he was president. He moved there from 100 Beacon and his mother moved back to Brookline at about the same time. In September of 1942, 102 Beacon Street, Inc., acquired 104 Beacon, and in August of 1948, 106 Beacon was acquired by William Taff’s brother-in-law, Edward Richardson Mitton, the president of Jordan Marsh department stores, who was married to Marie Frances (Taff) Mitton. In 1942, the Lynn Institution for Savings foreclosed on its mortgage originally granted to Mary Macdonough and took possession of 100 Beacon. The Taffs appealed the foreclosure by the Lynn Institution for Savings. Their appeal was denied and on January 12, 1944, the bank bought the property at public auction. William Taff continued to own 102-104 Beacon. On May 11, 1944, 100 Beacon was acquired by Maurice Harry Saval (Morris Savalonski), an insurance broker. He and his wife, Anna Ella (Bloom) Saval, lived in an apartment at 58 Commonwealth. On October 10, 1945, he transferred the property to Beaconside Realty, Inc., of which he was president. On April 26, 1960, 100 Beacon was acquired from Beaconside Realty by Emerson College. In March of 1961, the college applied for (and subsequently received) permission to convert the building from forty apartments into a dormitory. It continued to be an Emerson College dormitory until 2006. On August 29, 2006, 100 Beacon was purchased from Emerson College by BosProp Investors LLC. 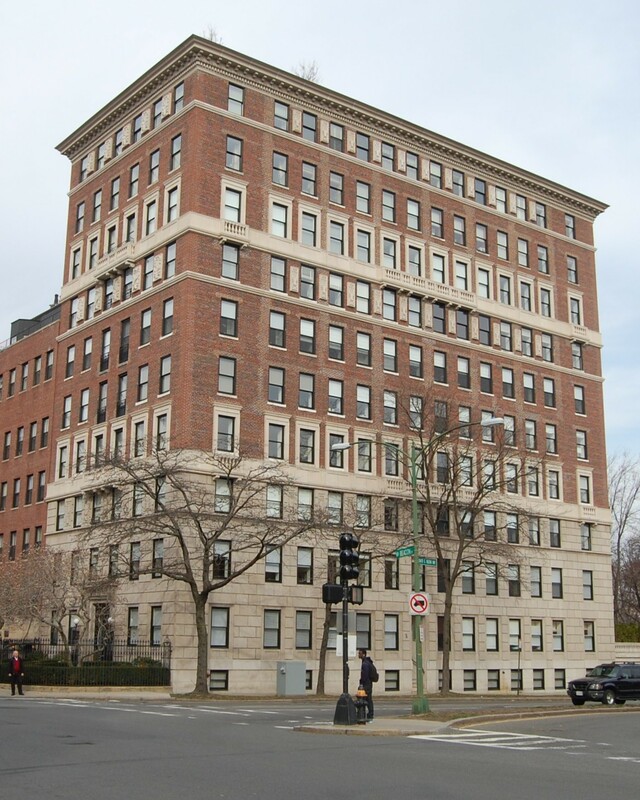 On March 27, 2009, BosProp Investors converted the units into sixteen condominium units, The 100 Beacon Street Condominium. The original townhouse at 100 Beacon was built ca. 1856, one of a symmetrical pair (100-102 Beacon) with a shared portico and front stairs and a mansard roof (among the earliest in the Back Bay). 100 Beacon was built for dry goods merchant George Otis Hovey and his wife Mary Ann Leveley (Cotton) Hovey. They previously had lived at 80 Beacon. George Hovey purchased the land for 100 Beacon on January 1, 1855, from the Boston and Roxbury Mill Corporation. The lot had a frontage of 56 feet on Beacon at the corner of what would become Beacon and Otter Street (later Embankment Road and then David G. Mugar Way). 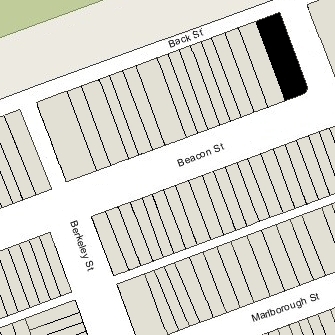 Otter Street had not yet been built, and in May of 1855 the Boston and Roxbury Mill Corporation sold a lot with a 10 foot frontage to the east of where the street was planned to go so that William Walter Goddard could construct a stable behind his house at 99 Beacon. 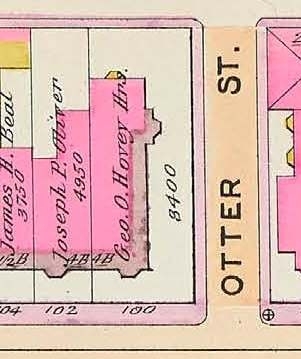 To accommodate Otter Street, on May 24, 1855, George Hovey sold the eastern ten feet of his lot back to the Boston and Roxbury Mill Corporation, Charles B. Fessenden, who owned the lot at 102 Beacon, sold the eastern ten feet of his lot to George Hovey, and the corporation sold Charles Fessenden a lot with a thirteen foot frontage to the west of his lot, increasing his lot from thirty to thirty-three feet. Click here for an index to the deeds for 100 Beacon (Demolished). On December 1, 1856, after the houses were completed, George Hovey and Charles Fessenden entered into an agreement to clarify their rights with respect to the shared portico, coal bin located under the front steps, cesspool, and drainage. George and Mary Ann Hovey made 100 Beacon their Boston home. They also maintained a residence at Freshwater Cove in Gloucester. From about 1869, they were joined at 100 Beacon by their son-in-law and daughter, John Torrey Morse, Jr., and Fanny Pope (Hovey) Morse. They previously lived at 129 Charles. He was an attorney, historian, and biographer. 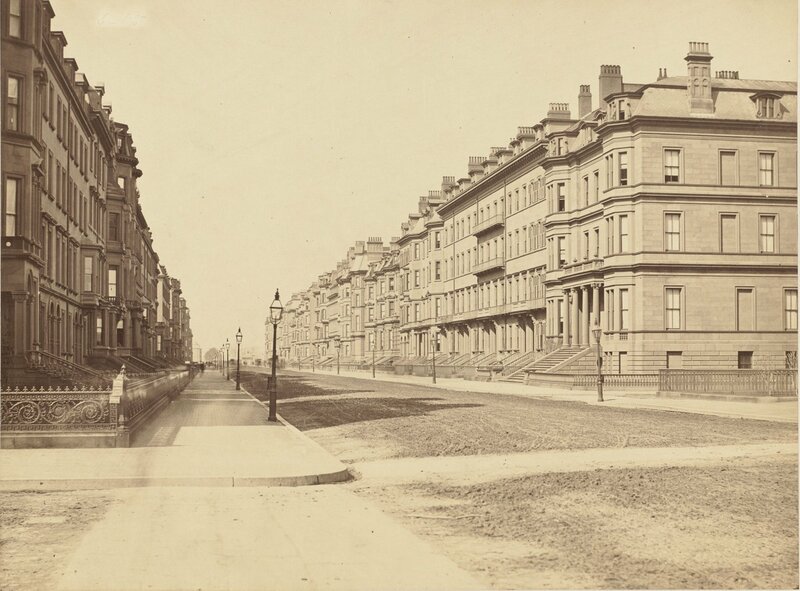 By 1873, they had moved to 9 Fairfield. Mary Ann Hovey died in October of 1873 and George Otis Hovey died in July of 1877. The Hoveys’ unmarried son and daughter, Henry Hovey and Marian Hovey, continued to live at 100 Beacon. They also maintained the family home in Gloucester, which burned in 1878, but they rebuilt in 1881. Henry Hovey was a dry goods merchant in his father’s firm and also was a prominent yachtsman, serving as Commodore of the Eastern Yacht Club in Gloucester, where he sailed his 109-foot keel schooner, Fortuna. Marian Hovey died in August of 1898. Henry Hovey made his home in Gloucester; he died in November of 1900. On February 9, 1900, 100 Beacon was purchased from the Hovey estate by Mrs. Ellen Wheaton (Ayer) Wood, the wife of William Madison Wood. The transaction was reported in the Boston Globe on February 17, 1900, which indicated that she purchased the house “for occupancy.” William Wood and Ellen Wood’s father, Frederick Ayer, had formed the American Woolen Company the previous year, consolidating several mills; it would grow into the largest woolen manufacturing company in the United States. The Woods previously had lived in Andover, where they continued to maintain their primary residence. They lived at 100 Beacon only very briefly, if at all. By the 1903-1904 winter season, they had made 21 Fairfield their Boston home. 100 Beacon was not listed in the 1900 and 1901 Blue Books. On March 25, 1901, 100 Beacon was purchased from Ellen Wood by William Stuart Spaulding and Dudley Leavitt Pickman. William Spaulding was agent for, and later would become president of, the Revere Sugar Refinery. He was a bachelor and lived at 99 Beacon with his mother, Emily (Smith) Spaulding, the widow of Mahlon Day Spaulding (William Spaulding married in September of 1909 to Katrina Fairlee). Dudley Pickman was an investor and trustee. 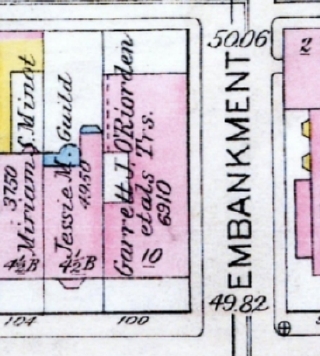 He and his wife, Ellen Rodman (Motley) Pickman, lived at 98 Beacon. William Spaulding and Dudley Pickman leased 100 Beacon to the Noble and Greenough School, operated by George Washington Copp Noble and James J. Greenough. It previously had been located at 97 Beacon, immediately to the east of the Pickmans’ home. By the 1902-1903 winter season, 97 Beacon had become the home of Ellen (Motley) Pickman’s brother and sister-in-law, Edward Preble Motley and Marian (Palfrey) Motley. They previously had lived at 202 Beacon. In mid-1901, 100 Beacon was significantly remodeled to convert it for use as a school. The remodeling was designed by architect Charles N. Cogswell. 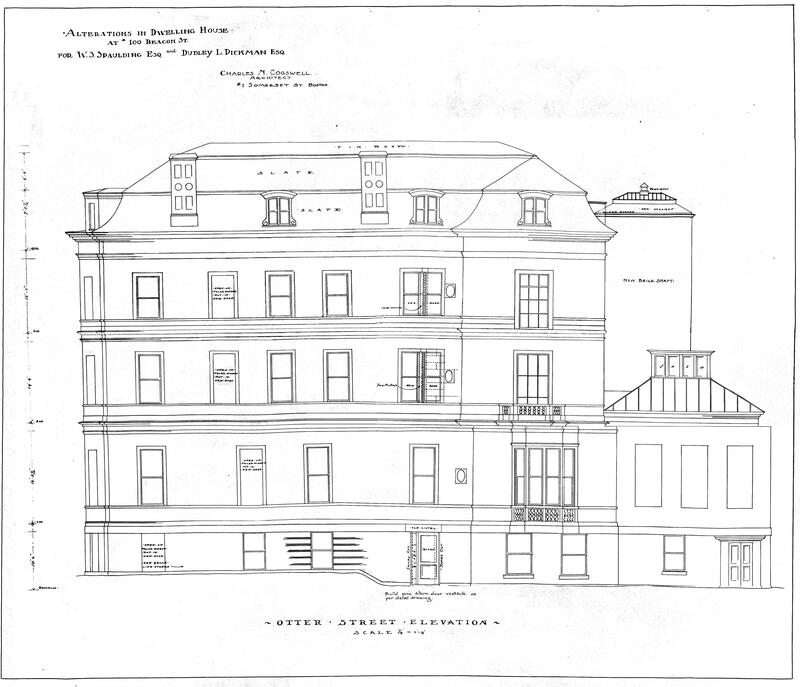 Plans for the remodeling — including elevations, floor plans, and framing and heating plans — are included in the City of Boston Blueprints Collection in the Boston Public Library’s Arts Department (reference BIN A-94). Noble and Greenough School remained at 100 Beacon until 1922, when the Middle School moved to Dexter Farm in Brookline and the Upper School moved to Dedham. After the school moved, the building was leased by the City of Boston to serve as an annex to Girls’ High School. On September 23, 1923, 100 Beacon was acquired from William Spaulding and Dudley Pickman by Mary Macdonough. The building was razed in mid-1924. 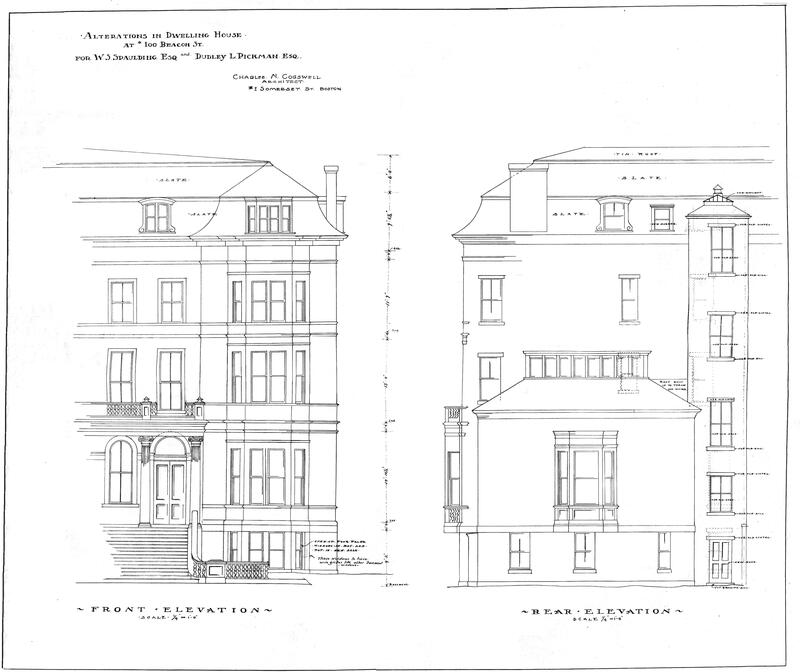 Below are architectural renderings of 100 Beacon prepared by architect Charles N. Cogswell in connection with the 1901 remodeling of the house into the Noble and Greenough School, showing the front (Beacon Street) and rear (Back Street) elevations on the left, and the Otter Street elevation on the right; provided courtesy of the Boston Public Library’s Arts Department, City of Boston Blueprints Collection.